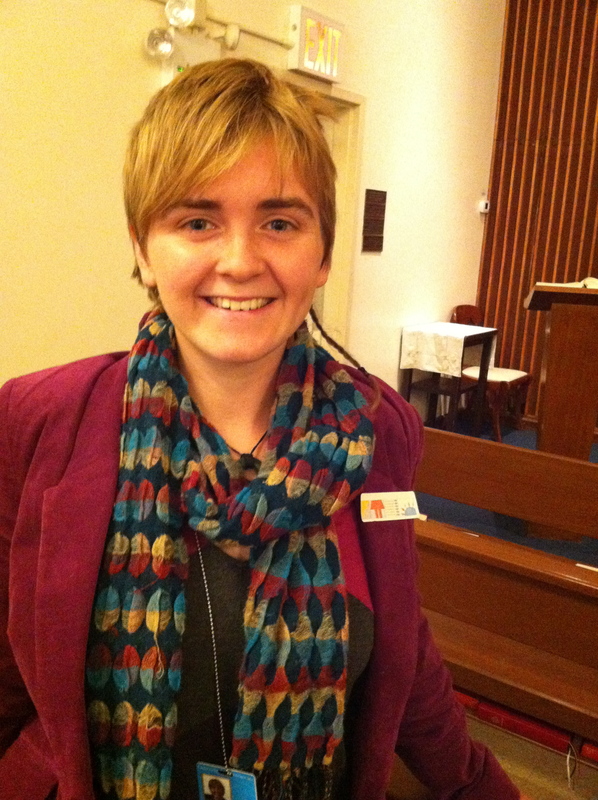 Rosina Scott-Fyfe is a graduate from Otago University in New Zealand, and part of the Student Christian Movement Aotearoa. She is part of the World Student Christian Federation delegation to the UNCSW57. Written March 11, 2013. I begin with these two quotes because they articulate why I am here: to use my faith to take real action; to use my faith to bring about real transformation in the communities I am a part of; to see the connections between myself and others, globally and locally, and to use my own personal voice to advocate for those who have less. To be part of the transformation of attitudes. Today I attended three parallel events which moved me and connected to my work in different ways. The first, entitled “Both Men and Women using their inner resources to bring change: relearning peace” and run by Brahma Kumaris, reflected on how we need to draw on our own “inner resources”- what some of us might label God, the Spirit- before we can make meaningful change. We had the honour of hearing from four inspirational panelists- Carl Murrel, Denise Scotto, Luis Mora and Gayatri Naraine, who shared with us through story and experience a richness of ideas. What resonated with me was the idea that we need to go beyond engagement and aim for transformation and elevated conciousness of our communities. And as Gayatri expressed, women we have a pivotal role of healing and transformation; although at our core, our soul does not have a gender, we were born into this body and onto this planet and it is up to every one of us to use our power for justice and peace. The most important tool is ourselves. I like the idea of primary prevention because it is all about changing attitudes, and addresses the underlying causes of violence. It ties in to our desire to belong. If our assumptions are that humans are innately violent, and if this is the way things roll in our communities, this idea is perpetuated through action. And the inverse is true: if we believe that humans are innately peaceful, and this is the belief of our community, this belief will be lived out. Nothing could be more important in the eliminations and prevention of violence against women and girls than the involvement of men and boys. The third workshop I went to today was so inspirational, and the room was packed. We heard stories from men working with men and boys on attitudinal change to hold the conversations about violence against women. Part of this is just planting the idea. It is about providing a new lens through which to look at these issues, because they are not just women’s issues: they are men’s issues too because while most men are not the perpetrators, most of the perpetrators against women are men, and, as the panelists shared, we cannot tell by looking at a man what his attitude will be. Men are also victims and survivors of this same violence, perpetuated by assumptions about gender. Some of the key messages from this powerful event were that we do not need a society that “protects” women, we need a society that respects women; and that men can be strong without the use of violence. Fathers and positive male rolemodels have a key role through the messages they give their sons. And a quote I found particularly inspiring, from Q Cochlin from Brooklyn’s Connect programme: “In doing this work, I become a human being”. Within the midst of this presentation, a conflict arose where a member of the audience spoke out about wanting time to ask questions, felt he was being lectured to, and was quite derogatory to the moderators of the event. I greatly admired the way in which the moderators handled the situation- not reacting, which would be the easiest thing to do, but treating the man who offered the comment with respect but also respecting the time and knowledge of the panelist who were there. It was a ‘wow’ moment for me, seeing this man really practice what he was preaching, using non-violence to proactively negotiate a conflict. I think that this is something all of us can learn from. So in reflection, our attitudes are how we live out our lives. To live our lives truthfully, we need to put into action the values we are promoting: faith and action is inextricably linked. These ideas are not new to any of us, but I think it is worth taking some time to reflect on. done a very good job with this. Additionally, the blog loads super quick for me on Firefox. Thanks so much for your kind words and feel free to share this site with your friends, family and faith communities!